How do you describe Permaculture? The discipline is dealing with what is good and bad and with moral duty and obligation. The principles of conduct governing an individual or a group. A consciousness of moral importance. 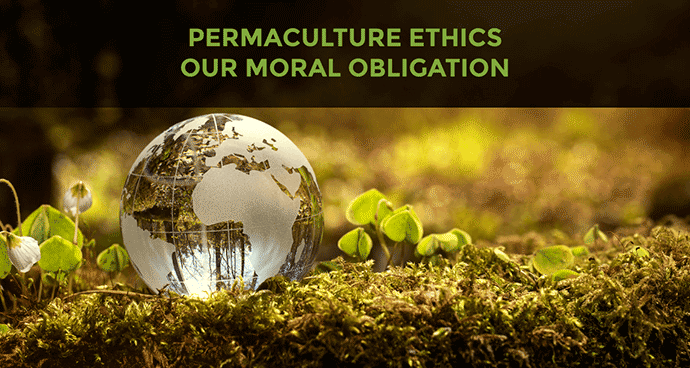 Words like principles of conduct, moral duty, moral obligation, and a guiding philosophy are words we need to think about when it comes to the care of the earth, the care of people and fair share, the three permaculture ethics. Many elements come to my mind under the care of the Earth ethic: soil, air, water, trees, plants, animals, and even the smallest of microorganisms. We all have one earth. We should all have the same moral obligation to care for the Earth and the resources the Earth supplies us. It is our moral obligation to ensure that we leave a planet so that it does not hinder the ability of future generations to be able to satisfy their own needs. I have written an article on interpreting Pope Francis’s ‘Encyclical letter Laudato si’ of The Holy Father Pope Francis: On Care For Our Common Home, and in that article, Pope Francis describes the Earth as our common home and how our actions are causing destruction to our home. Although Pope Francis doesn’t mention Permaculture by name, he does too mention our moral obligation to care for the Earth. To me, his words are a great example of this permaculture ethic. The care of ourselves, our families, our communities, and people across the world. To achieve a harmonious relationship between ourselves and others, we need to accept, respect, incorporate, and expand on each other’s different abilities, experiences, diversities, ethnicities, and strive to work together as a whole instead of against each other. Set reasonable limits and redistribute surplus. We need to reinvest the surplus into the first two ethics. We have a culture where there’s a lot of waste, has become common practice to throw away instead of sharing. Fair share is about setting reasonable limits and balances in production and to ensure that surplus is distributed fairly among those who need it most or is fairly traded for goods and services. Limits and balances that work alongside the care of the Earth and the care of people to reach the goal of rebuilding the paradise of earth. Why It’s Our Moral Obligation? Consequently, these three ethics ensure that Permaculture is more than just a design system. Which it provides us fundamental philosophies to address and achieve a sustainable paradise within and outside our own borders. Changing the way we care for the earth, ourselves and other people. Further participating in sharing fairly the surplus of our produce in sharing fairly the surplus of our produce. Always remember the problem within itself is the solution!